Below you can view all the homes for sale in the Skyland subdivision located in Denver Colorado. Listings in Skyland are updated daily from data we receive from the Denver multiple listing service. To learn more about any of these homes or to receive custom notifications when a new property is listed for sale in Skyland, give us a call at 720-729-2320. Roughly 400 square feet with Kitchenette and bathroom. MLS#4235372. Your Castle Real Estate Inc. The builder, AZCO Investments, has been building custom homes for 35 years. 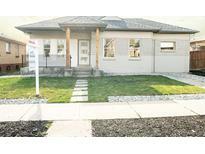 MLS#7548875. Danna Lyn Johanson. This house is move-in ready. Act fast! MLS#8510598. HomeSmart Cherry Creek. Estate sale, sellers will not be available until Monday April 15th please have all offers submit by 8am the same day. MLS#8763196. RE/MAX Momentum. Steps away from the golf course, City Park, Denver Zoo, and the Science Museum, and an easy bike ride to RiNo, Coors Field, and Downtown. MLS#6425358. Keller Williams Integrity Real Estate LLC. Solar Panels significantly offset electric bill! MLS#9245284. Madison & Company Properties. Private, fenced yard with large patio is perfect for enjoying the Colorado sunshine and entertaining. MLS#2299068. Keller Williams Realty Urban Elite. New sewer line to the city main line. Buyer to verify square footage. MLS#4240322. Compass Colorado. Zoning allows for addition of rental unit, convert the basement or build ADU off alley. MLS#4597837. MB Clarke Real Estate. Roof will be replaced before closing on the main home. Amazing hot location! MLS#8600177. SHOWCASE PROPERTIES UNLIMITED. You CAN have it all in the heart of Denver if you hurry! MLS#9492627. Keller Williams Preferred Realty. https://www.niche.com/places-to-live/n/city-park-denver-co/ 5280.com rates City Park among The Top 25 Places to Live in Denver Right Now. https://www.5280.com/2016/04/the-25-best-places-to-live-in-denver-right-now/ MLS#8639802. Keller Williams Preferred Realty. The home is in great condition overall with central air conditioning and a recently serviced furnace. MLS#2621029. PASSPORT HOMES LLC. Charming Two Story Victorian * Updated Kitchen with Granite Countertops, Stainless Appliances, Large Pantry * Good Flow - Kitchen Open to Dining and Living Areas * Three Bedroom (Two Upstairs, One on the Main Level - Perfect for a Home Office) * Tall Ceilings, Exposed Brick, Tons of Natural Light * Private Backyard with Large Deck, Sprinkler System and One Car Detached Garage * Great Opportunity!! ! MLS#9601393. OLSON REALTY GROUP.